After California (Los Angeles and San Diego), the path leads us to Nevada and Las Vegas. Frankly, I wasn’t ready for Vegas. My boyfriend loves this city, it attracts him (let him, and he must have some flaw). I imagined it as the most kitsch, fair Disneyland for adults. The deal was, let’s go for him in Vegas and I’ll use it to see the Grand Canyon. I knew that this gambling town, but … Everyone knows that Las Vegas is not going to be culturally rises more for fun and enjoyment. However, the whole Vegas is one big piece of illusion. Weather, moral, physical boundaries to which we are used to here does not exist. 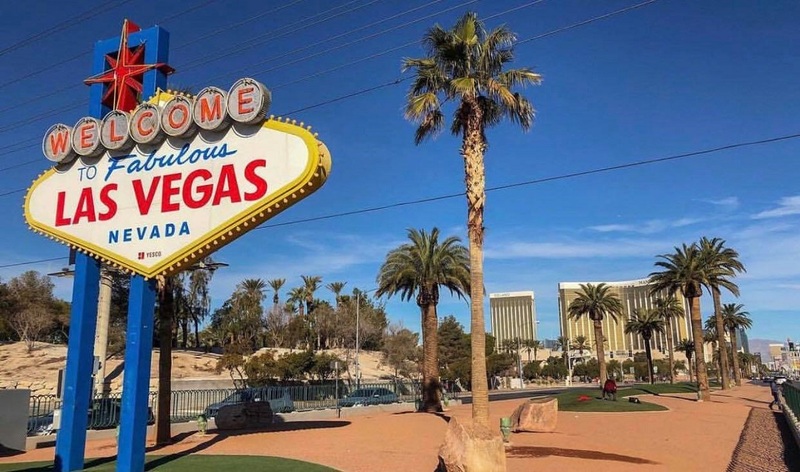 Because of its content – from world-class restaurants, shopping, the most prestigious world-renowned brands, the most exclusive and amazing hotel to the entertainment and nightlife, Vegas is a reason one of the main tourist destinations in the world. We arrived in this circus at night, darkness had already fallen, and the Strip (the street where everything is in Vegas) is glowing like a Christmas tree. Everything in Las Vegas is a grand, exaggerated, spectacular. Some special atmosphere prevails, feel free in the air, in people’s behavior. Such a rare relaxation town. Sensations in Vegas is endless. No wonder they call it Sin City with five stars. One of the crazier places in the world that I have visited. 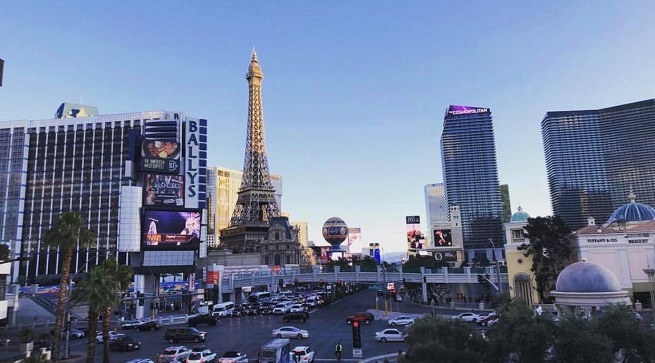 Literally, for a two-three hour walk through the Strip, you can change five or six cities and three continents, but also for the whole day or more, spend without leaving out. The city is amazing, crazy and constantly changing and over and constantly provides something new, something more impressive than the last. Simply, it is a must see and experience. This city you get under the skin (us definitely is). It’s amazing how much attention to detail and how everything is done perfectly. 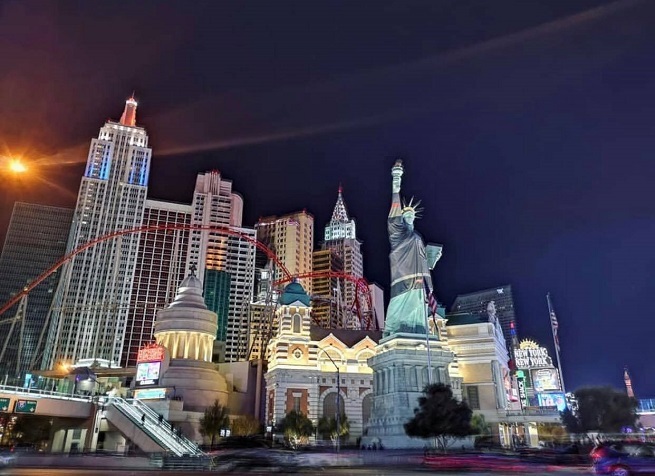 So, in Las Vegas at the same time we have experienced the magic of a number of different cities, a little gambling and enjoy the great fountains (Las Vegas without them would not be what it is), music, and some of the famous show-program. Since we were of February, the only thing we are not of the standard things seen and experienced as a party to the pools. The pools are open until mid-March. For night owls, Vegas is probably a dream city. You don’t have to be a fan of gambling that you want a few days of worry-free stay in the glittering capital of the gambling and fun. 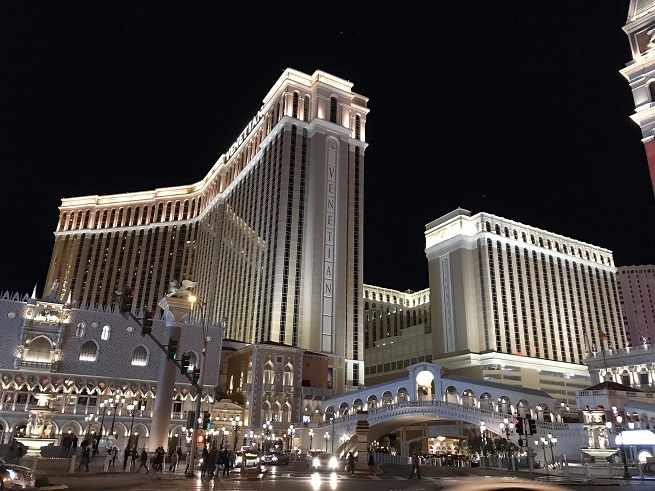 Walking through the Strip, we passed through Paris, Venice, New York, Lower Egypt … one after the other hotels that are thematically completely in line with the city they represent. 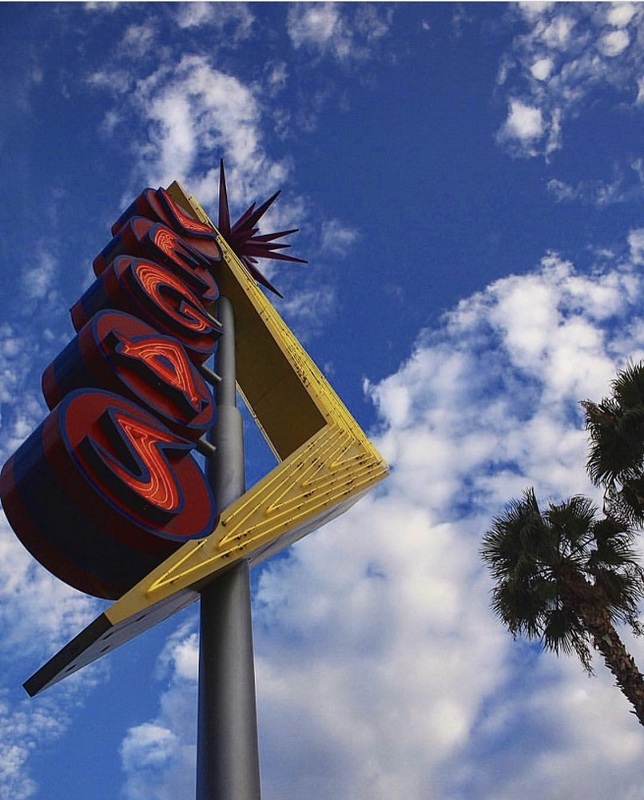 By entering into any of the hotels in the Strip, and you’ll enter a world of imagination. Each of them is a destination unto itself. No, this is not standard hotels you are used to, they are really cities. You need ten days to visit all hotels and see what they offer. All are connected internally once you enter do not need to go out in the daylight. Interior lights are pleasant when you are there you do not know if it was day or night. Who has the money can enjoy the spectacular daily shows. The biggest spectacles are magician David Copperfield show or stand-up performances, circus shows produced by Cirque du Soleil, cabarets, martial arts matches and concerts by the biggest pop-icon and international star. 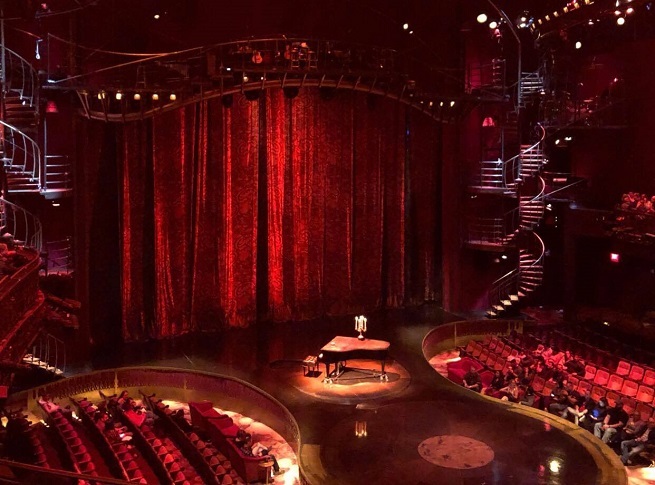 We watched new show Cirque du Soleil, Zumanity (18+). We are not look for the first time Cirque du Soleil, however, this play is set in a little intimate theater and the way we experience is different than the previous we saw in the enormous arena. This is definitely a spectacle! Above your head you are flying acrobats and special effects are breathtaking. We were left without a word. Also, we were amazed at the number of people on the streets during the day. It seems to lie that the crisis because the crowd was unseen anywhere. Chow and cuisine in the hotel’s famous, a huge number of world famous restaurant located in Vegas. 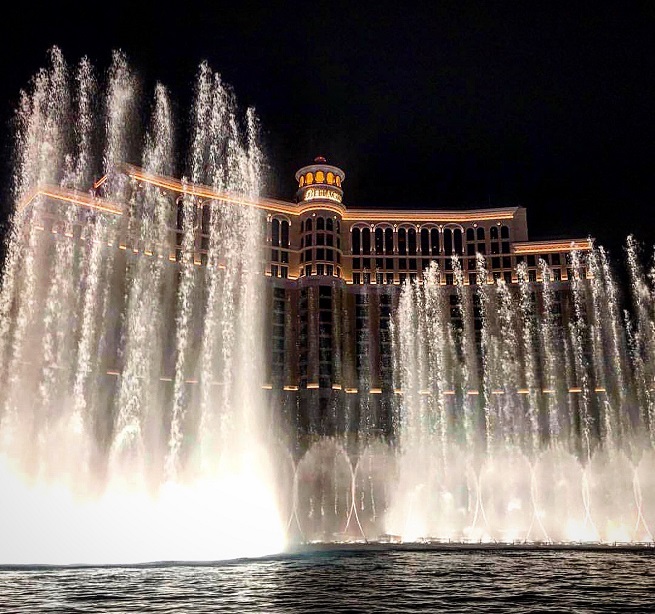 What is left us a good impression of the beer with a view of the Bellagio fountain. Do not be left out and shopping in Las Vegas. 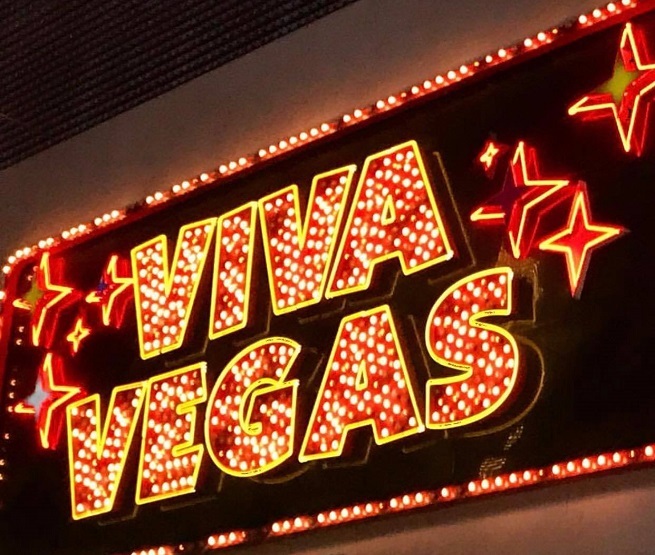 Although we do not like gambling, which is the first association to Las Vegas, we were convinced that the city is crazy in their own way, because of the specifics I think it should be visited and experienced. Almost all year round nice and warm weather, gorgeous sunsets and relaxed atmosphere. Las Vegas kitsch stands the best of any city on the planet. After Vegas, the road takes us to the timeless, film Grand Canyon. Stay tune.